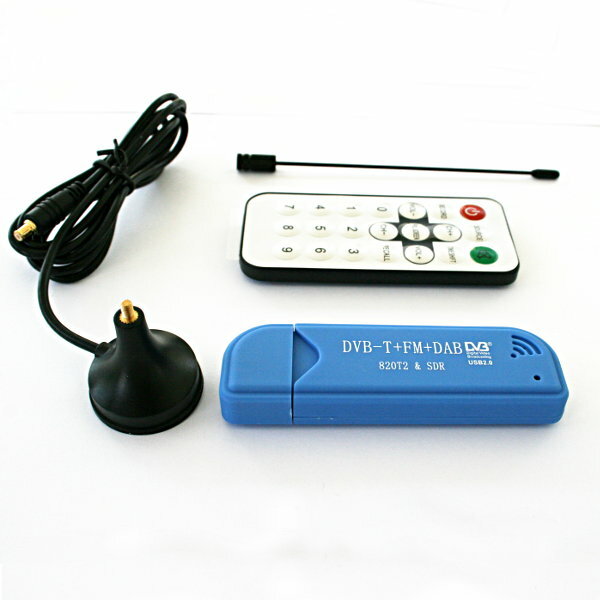 This is the new version of the DVB-T / SDR dongle with the improved 820T2 tuner chip. These dongles with the RTL2832U/R820T2 chips from Realtek got quite popular lately due to the fact that they not only are able to receive DVB-T radio and TV broadcasts, but they can also be used as Software Defined Radio - 'SDR' which opens a lot of possibilities. If you've ever been curious about software defined radio, this USB stick is the easiest way possible to have fun with a powerful, configurable receiver. Packed with the powerful RTL2832U and R820T2 tuner, it can tune into signals from 25MHz to 1700MHz. That means you can use a computer (with Windows, Mac, or Linux) to tune into: FM Radio, AM signals (but not AM radio), CW (morse code! ), unencrypted radio signals (such as those used by many police and fire departments), POCSAG pagers, and more. The dongle comes complete as pictured with remote control, antenna and antenna cable with stand.